Children are valued here at Grace Congregational Church. Babies and children of any age are encouraged to worship God with us. Parents are also welcome to use the childcare that we offer in the nursery on Sunday morning. We seek to provide an atmosphere throughout our ministry that welcomes, loves, and supports our children. Our Sunday School program offers classes throughout the year. From September through May all of our children (pre-K – 6th) meet together in the sanctuary at 9:15am. After a time of music and storytelling, each age group follows their teacher to their classroom in the education wing. Parents or guardians pick up their children from the classrooms at 10:15 am. In the summer, an inter-generational (all ages) Sunday school will meet in the Fellowship Hall on the first Sunday of the month at 9:30 am. We also have a Vacation Bible School Program. 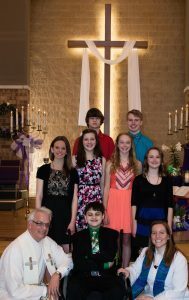 A two year Confirmation Class is offered for youth in seventh grade and older. It meets on Wednesday evenings during the school year, and seeks to help youth develop a deeper understanding of scripture, history, mission and the church. Our Confirmation Program also includes a variety of retreats and class trips that we hope will increase their awareness of God’s work in this world. Our High school youth group, Generation G, also meets weekly on Wednesdays. At Grace, the safety of our children and youth is just as important to us as their faith development. Please see our Safe Conduct Policy here.